TFTR's achievements generated headlines around the world and laid the foundation for the development of fusion energy in facilities such as ITER to demonstrate the feasibility of fusion power. 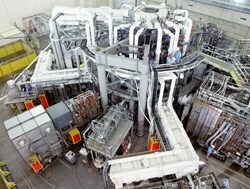 Tensions rose in the US Department of Energy's Princeton Plasma Physics Laboratory (PPPL) as the seconds counted down. At stake was the first crucial test of a high-powered mixture of fuel for producing fusion energy. As the control-room clock reached "zero," a flash of light on a closed-circuit television monitor marked a historic achievement: a world-record burst of more than 3 million watts of fusion energy—enough to momentarily light some 3,000 homes—fueled by the new high-powered mixture. The time was 11:08 p.m. on Thursday, 9 December 1993. "There was a tremendous amount of cheering and clapping," recalled PPPL physicist Rich Hawryluk, who headed the Tokamak Fusion Test Reactor (TFTR), the huge magnetic fusion facility that produced the historic power. "People had been on pins and needles for a long time and finally it all came together." It did so again the very next day when TFTR shattered the mark by creating more than six million watts of fusion energy. 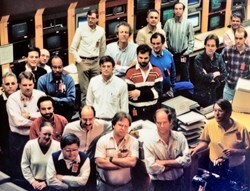 Thursday, 9 December 1993, 11:08 p.m. at PPPL: staffers monitor a closed-circuit screen focused on the experiment. The achievements generated headlines around the world and laid the foundation for the development of fusion energy in facilities such as ITER to demonstrate the feasibility of fusion power. The results delivered "important scientific confirmation of the path we are taking toward ITER," said physicist Ed Synakowski, a PPPL diagnostics expert during the experiments and now associate director of the Office of Science for Fusion Energy Sciences at DOE. "I felt an important shift in the understanding of fusion's likely reality with those experiments." The breakthroughs proved the practicality of combining equal amounts of the hydrogen isotopes deuterium and its radioactive cousin tritium—the same combination that will be used in ITER and future fusion power plants—to form the superhot, charged plasma gas that fuels fusion reactions. The deuterium-tritium (D-T) mix produced some 150 times more power than a reaction fueled solely by deuterium, long the stand-alone ingredient in tokamak experiments, or "shots." "This was the first test with equal parts D-T and it was technically quite challenging," said Michael Zarnstorff, a task-force leader during the experiments and now deputy director for research at PPPL. "What we did marked a huge advance in integrating tritium into fusion facilities." Gained insights included precise measurement of the confinement and loss of alpha particles that fusion reactions release along with energetic neutrons. Good confinement of the alpha particles is critically important since they are to serve as the primary means of heating the plasma in ITER, and thereby producing a self-sustaining fusion reaction, or "burning plasma." Read more on the PPPL website.